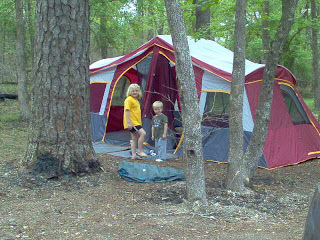 My family camped a lot--family vacations, Girl Scouts, for fun in the backyard. I loved it. I always said that Mr. Right had better be able to pitch a tent. Luckily, he could. We had many adventures camping in Oklahoma and then we had kids. Camping got pushed aside with play dates and birthday parties. When my daughter was 5 and my son was 3, we ventured into the woods again. We were seriously over prepared--too much food, too much gear, too many clothes. We watched in fear as my prissy little girl looked at our campsite, wrinkled up her nose and then squealed, "rolly polly heaven!". She proceeded to collect those little bugs and make houses and mazes for them. My son eargerly helped his big sister collect twigs, rocks, leaves. They were happy. We could relax. Our kids were campers at heart. It's in their DNA. The years have past. My 5 year old prissy girl is now 12 and a total tomboy in the woods. My son turns into a wild thing. Dirt, bug bites and scratches are part of his daily attire. In 7 years, we have this camping thing down. We can be ready for a weekend trip in a matter of a couple of hours and a week long trip in a couple of days. The art of camping and love of spending time in the outdoors with my family drove me to this blog. I also saw your blog on Pinterest. Love camping with my daughter. We go on a annual camping trip every August and we're always looking for cool camping stuff to add to our collection. Found you on Pinterest today and I'm looking forward to reading your blog entries! Just finally found my Mr. Right who loves camping and we're headed out the next 2 weekends (one with kids one without)! Thanks for this blog and the great ideas! I started camping when I was 13 and since then, I've always encouraged my friends to spend vacations in the mountains.